“It was all a dream”, as my local friend and occasional flatmate on monster Thibeaut pointed out (quoting the title of a Tupac song). And he was right of course. Only sometimes dreams turn into a bit of a nightmare. Especially when pirate vessels with half a ton of illegal diesel collide with the ACAB authorities. But first things first. 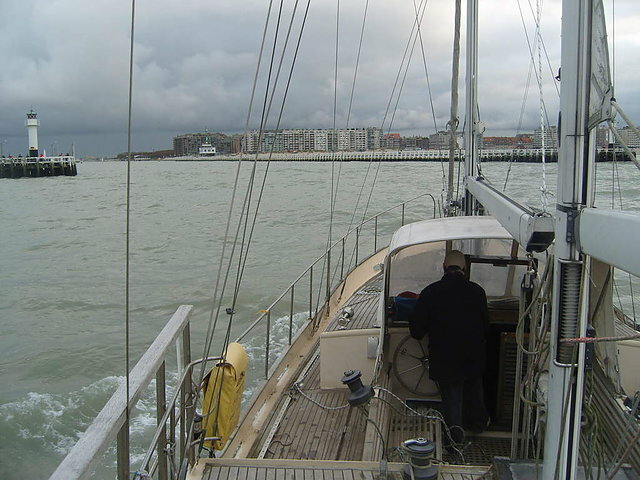 Following a rather positive test drive with monster outside the Nieuwpoort harbour (my friend Ernst at the wheel in this pic) and some more fiddling on the interior, we finally set out for Blankenberge at the end of October. 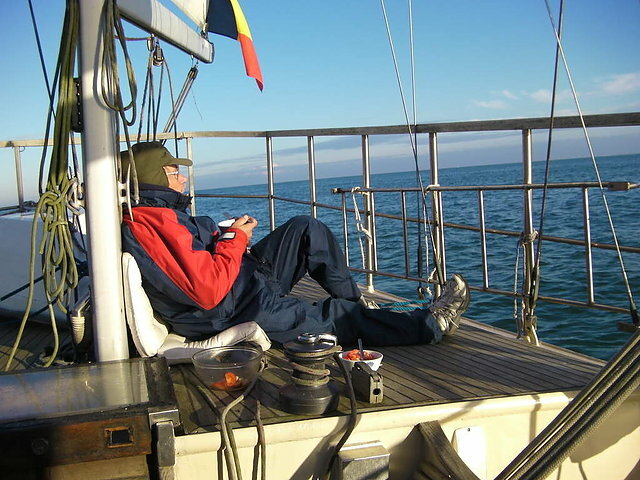 We had a lovely sail down without the Genoa making 6-7 kn in some favourable current, as the forestay was to be fixed in Blankenberge, and I was in a triumphant mood having finally started my hopefully epic journey following 5 months of camping on the hard (boat parking lot) in West-Vlaanderen. Leaving Nieuwpoort, we had been approached by a military RIB requesting us to stay 2 miles offshore due to exercises, and I did notice we were being shadowed by a destroyer-sized vessel on our journey towards Oostende. Plus there were lots of helicopters around. The Belgian military doesn’t seem a whole lot to do and the coastline is very short, plus we were the only ones out there. Why can’t they dissolve the whole pathetic show and get people into real jobs? When I noted yet another RIB approaching from behind, I pretty much expected it to be some form of uniformed harassment. And it was. Only, as I quickly found out, they were having some type of joint exercise, and I actually got a team of customs types on board. 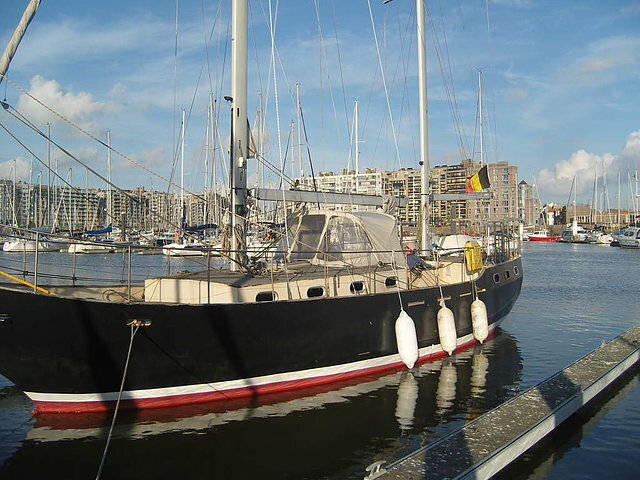 Now that didn’t please me too much as I had around 600 litres of ancient red diesel in my tank, which is now illegal to use on pleasure boats in Belgium. I was actually aware of this, but sort of hoping I could talk myself out of it since I could prove this to be legacy fuel (as in from before they outlawed it). So I was a bit anxious and started playing their paperwork game of filling in forms and showing them various bits of paper I had so they could tick all their little boxes (and bugger off please! ), when the ugliest one of the uniforms produced a little diesel sampler. I showed him my tank in the vein hope that the 24 screws might put him off, but he just got out a longer tube to stuff down my tank inlet. He produced a small excited noise of joy for his colleagues when he had finally pumped some of my “roode mazout” into his receptacle. He then proceeded to lose his receptable down my tank inlet. They pointed out that this would entail a EUR 1250 fine, payable in cash and on the spot. I was a bit shocked as it would be difficult to produce this much cash in one day even if there was a cash machine around since my bank cards have been limited to EUR 1K a day since the Brazil days in case of kidnapping etc. The uniforms thus decided to accompany us to Blankenberge and chain me up there. Since I was to have them on board for two hours I gave them the warmest “welcome on board” I could muster given my atrocious mood, and actually offered them a Belgian waffle. Sadly I had no rat poison or laxative around to spice them up a bit. I spent the rest of the trip at the bow having suitably dark thoughts. But make it to Blankenberge we did, and I was once again in the old triumphant mood. Boating seems to be a bit of manic depression, or as Goethe put it, “Himmelhoch jauchzend, zu(m) Tode betrübt“ (heavenly joy, deadly sorrow).